Vintage set of Japanese wood nodder kokeshi nesting dolls from the 1970's. 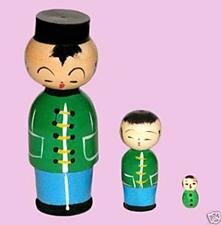 The tallest or father kokeshi measures 3.5" tall, the middle doll/son measures 1.5" high, and the baby measures just 1/2" tall. The father and middle son are both nodders, but the baby's head is stationary. They are wearing green chinese-type tops with "frog" closures, and blue bottoms, except the baby, he's mostly just green. Really cute set of nesting dolls. This kokeshi doll set is in good vintage condition - hard to find many flaws.